Now the collection continues, with these top photography portfolio sites that exemplify the idea of how the design can be used to reflect the photographer’s own personality and style to marvelous ends. Daniel Weisser’s photos are minimal, simple, and clean. You could say the same of his portfolio. It feels minimal and almost under-designed, but the simplicity underscores the image’s understated nature extremely well. 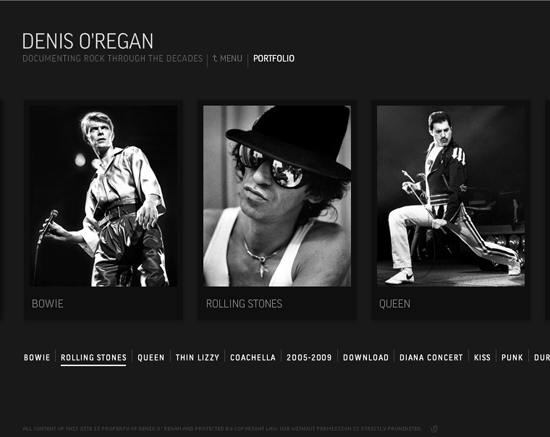 The site is a straightforward showcase, displaying the full portfolio in an irregular grid. Resize your browser or filter by tag, and the grid animates and reconfigures fluidly. Select a photo and an unstyled jQuery lightbox pop-up provides the image detail view. All the other features live in lightboxes, as well, including the About and Links tabs, making this a portfolio with a single, understated page design. Henrik Knudsen’s site feels like strips of negatives laid out on empty space. His images, often sparse depictions of wide open landscapes and expressionless faces, work with this negative space. The desaturated colors overlain on the dark black background mesh well with a theme of vacantness. The photo strips are organized into project gallery grids with titles like “The North Country” and “Unfinished Journey”. You can find your way around by clicking in to an image; the zoom metaphor feels seamlessly integrated, and gives great visual cues to your location on the site. You can jump from gallery to gallery, and create your own curated favorites album. Koen Demuynck’s fantastical, mischievous images often feature movement. His stills capture the arc of motion at its most expressive and kinetic. The portfolio’s UI is kinetic in its own right. The site loads with an advancing line, and then the navigation bar slides out smoothly. Select a gallery and the nav bar slides back as the image moves forward. Click on the arrow to advance to the next image, and it slips quickly out to replace the last. The fluid navigation bar is accessible from each photograph. The minimal and non-traditional UI lets the photos stand out, displaying them in large image detail view or teaser grid view. Fredrik Clement’s images are textured and sometimes even grimy. His sharp eye for sports and the people who do them capture the smallest droplets of sweat and motes of dirt. His portfolio gets out of the way and makes his eye for detail shine, using the latest trends in UI to let the images fill your screen and the textures come forward. The full bleed images filling your browser are covered by navigation and menus only when you hover over the menu arrow. Your cursor becomes a simple, rotating advance / return arrow. Social media integration is available for each image, but doesn’t reveal itself unless you pull up the menu. Joshua Stearns is interested in hip, young people being hip, young, and disaffected. His portfolio is just as cool and youthful, from the galleries being non-traditionally divided up into color palettes, to the simple plus sign slyly hiding not just Facebook and Twitter integration, but youth-populated Stumpleupon, Digg, and Delicious social media options as well. The site’s view is customizable and responsive; you can resize all of the images in the grid with the slider in the footer. A simple, irregular grid animates and reorganizes when you select a gallery. Your cursor turns into styled back and forward arrows on the sides of the images, but a grid icon that takes you back to the main gallery in the middle. Denis O’Regan’s images make you feel like you’re sliding through the decades of rock and roll, glimpsing moments of musical history as they’re made. They put rock stars in context, making them larger than legend. His portfolio slides through the ages in the same way. It loads with an advancing count-up of years, from 1977 to today, and the horizontal strip of sliding galleries are chronologically ordered. There are no grids, replaced instead by advancing slideshows that let you experience the images in order sequentially. Ben Thomson and Nick Onken have a lot in common, from the images of young, pretty, happy things, to the red/white color scheme. 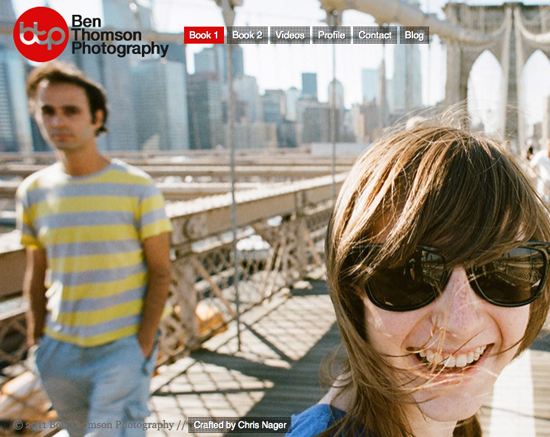 Ben Thomson’s images are a little bolder, a little less sunny, but just as youthful and hipster-populated. His portfolio is interactive, too, with a clean style and youthful flair.The navigation is fun, with arrow keys letting you move around without your mouse, or a cursor that becomes a big, bold rotating left/right arrow. Social media is integrated beyond the big two, adding a Flickr feed and Vimeo channel, and you can choose your own view, toggling between image flow or responsive grid. Chase Jarvis’ images feature exploration, adventure, or at least vacation. He’s interested in people finding happiness, and if not happiness then maybe just a laugh. His portfolio is a chronicle of people searching for their bliss. It encourages you to explore to find yours, as well. The galleries are displayed in grids, which are navigable in chunks by footer grid icons. Click into a gallery and scroll through the image flow, following your progress through the footer thumbs. Go back and start again, picking a new gallery and a new bliss. 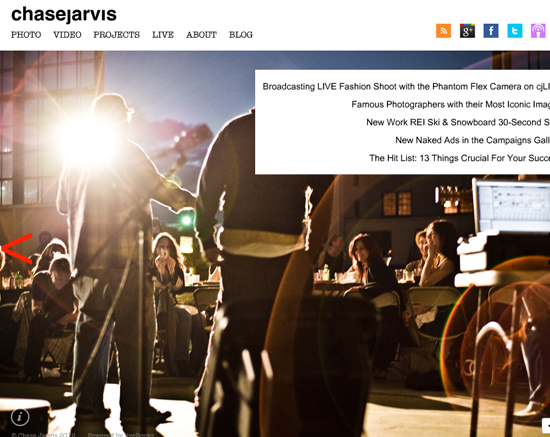 The site also effectively draws attentions to events and recent projects, something many portfolio sites don’t manage. RSS and copious social media networks are available from anywhere on the site, so you can share your adventures. 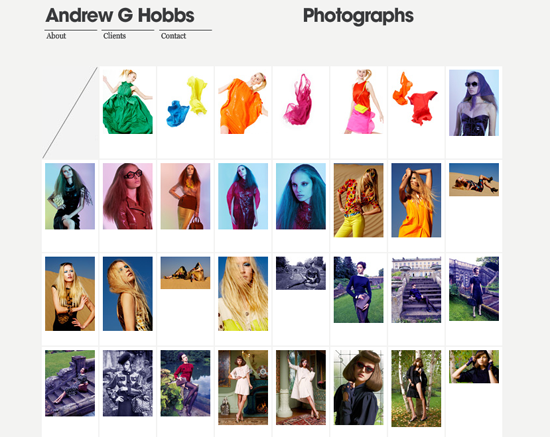 Andrew Hobbs is a fashion photographer. His portfolio is a single, large, responsive grid with a very effective reorganization metaphor. The grid is set out like an organized desk of cards. The images deal out as they load, and then slide into place when they reorient. Select one and the others jumble and part to show you the enlarged image. Click out and the grid realigns. These sites all make their images look good. But that’s the baseline. They also manage something much more difficult: giving a hint of the photographer’s style, mirroring the images’ tone, themes, and interests. We may have picked our top fifteen photography portfolio sites, but the list is far from complete. What do you think? Discuss the sites, or share your own favorites, and tell us why you think they reflect a style or personality in the comment section.